These are the very best gaming laptops on the market today in 2019. So, if you want the best gaming laptop to play your PC games without compromise, we've not only got the definitive list of laptops for gaming, but we've also got a wealth of useful information to help you decide which gaming laptop is right for you. And the good news if you're in the market for one of the best gaming laptops in 2019 is that, right now, we're now seeing plenty of respected retailers offering some truly excellent gaming systems at very attractive price points. So, regardless of if you are looking for a cheap laptop for gaming, laptops for gaming under £500, or a hyper premium, money-no-object gaming laptop, this curated guide definitely has systems worth considering. Cutting right to the chase, though, we think the best gaming laptop on the market today is the Asus ROG Zephyrus S GX701. It is amazingly thin and light, remarkably quiet, and – most importantly – lightning fast, packing an outrageously powerful Nvidia GeForce RTX 2080 graphics card into its sleek, premium casing. The Asus ROG Zephyrus S GX701 is also unashamedly expensive in terms of its price as well, so it's not going to be for everyone – but we think it's simply the best gaming laptop you can buy right now, and to get the best you usually have to pay for it. But don't worry, there are also plenty of great machines at more affordable prices in this expertly curated best gaming laptop guide too, including the impressive MSI GS65 Stealth, budget-friendly Dell Inspiron 7000 Gaming, the high-end performance Alienware 17 R4, and the stylish Gigabyte Aero 15X. Our list of the best gaming laptops is sure to meet your needs and desires when it comes to portable PC gaming, so without any further ado, let's get right to it. Internal components to screen resolution balance is crucial when choosing a gaming laptop. What you're looking for in the best gaming laptop of 2019 is the capability to run the most demanding games of the day – graphically intensive games – without having to make loads of settings compromises. Bad gaming laptops advertise themselves on their gaming credentials, but then deliver vastly inferior performance to their desktop counterparts, so its absolutely crucial that you avoid these clunkers. High-resolution screens are a nice added bonus on a gaming laptop as well, but it's important to keep in mind that high frame rates are far more important when gaming on the go – so it's pretty pointless plumping for a laptop with a 4K screen if it doesn't have the interior hardware to power games on it. Other things to look out for when buying a gaming laptop include weight and portability (after all you are buying this to carry around), battery life (a fundamental issue with many gaming laptops), and price. Here at T3 we think you should be spending a minimum of £800 (about $1,045) on a gaming laptop to ensure a good level of performance, and more than £2,000 if you can stretch to it if you want something at the premium end of the scale. There are some hyper-premium systems that retail for over £3,000 and, well, if you can spend that money then that is the price tier where you will get the absolute best tech and future proofing. So, without further ado, here are the best gaming laptops available today in 2019. 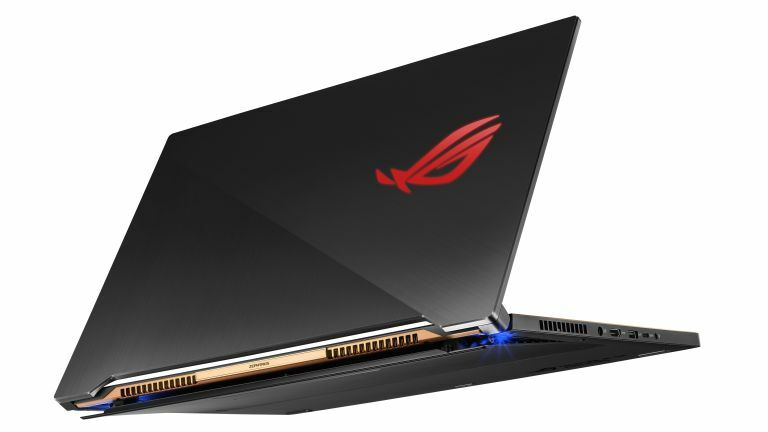 The best gaming laptop in the world today is the Asus ROG Zephyrus S GX701. As we confidently stated in our full Asus ROG Zephyrus S GX701 review this gaming laptop is loaded with a suite of state-of-the-art gaming hardware, boasts an incredibly premium build quality, and packs an innovative and portable design, too. Simply put, it is the best gaming laptop in the world. The GX701's Nvidia GeForce RTX 2080 is simply insane, both in terms of raw processing power and in terms of features, with the Max-Q card allowing you to turn on next-level graphics options such as real-time Ray Tracing, the latter making lighting in games even more realistic and lifelike. This GPU combined with a rapid Intel CPU, buckets of fast RAM, and a large and capacious hard drive make playing any PC game today a zero-compromise joy, while the mature and stylish finish and dense, premium build quality means the system looks perfectly at home in the office as well. The only obvious stumbling block with the GX701 is its incredibly high price point, but if you can afford it and are looking for a hyper-premium new gaming laptop, then this is without doubt a fantastic choice. The MSI GS65 Stealth is a sleek gaming powerhouse, and one of the very best gaming laptops in the world today. MSI has come out swinging as of late, aiming to take on the gaming laptop market by introducing the power of Intel's Coffee Lake processors into the equation. As such, the MSI GS65 Stealth is one of the absolute best gaming laptops available in 2019, and a great alternate choice to the Asus ROG Zephyrus. Alienware always delivers superb build quality in its gaming laptops, and it is business as usual with the Alienware 13 R3. +Gorgeous OLED screen+Improved hinge-forward design+Power! As ever, battery life or weight isn't the best, but these are minor issues to a really tasty, top-tier gaming laptop. If you're looking to shop in the mid-range best gaming laptop market price-wise, then the Asus ROG Strix GL502 is a superb option. As you would expect, battery life isn't stellar; however, the rest of this very well-priced gaming laptop make it a top contender. The Dell Inspiron 7000 Gaming doesn't look flashy, but it's a well-priced, powerful gaming laptop. Dell's latest gaming-focused range of laptops are an ideal option if you're looking to invest in a machine that can handle the every tasks of life AND your PC gaming needs. This is undoubtedly one of the best gaming laptops of 2019. Even the basic model comes with a Nvidia GeForce GTX 1060 and an impressively robust cooling system to keep that beast of a card from melting. With 16GB of RAM, a 128GB solid state drive, a 15-inch Full HD screen and speakers with WavesMaxx audio, you've got one impressive package from the people at Dell. You'll get just over eight hours of use on a single charge, which is okay, but it can also charge up to 80% in one hour – so you won’t have to wait long to keep gaming on the move. A beastly portable gaming system, the Asus ROG G703GI is as expensive as it is powerful. Sometimes bigger really is better, especially when you're a gaming laptop that's gargantuan in almost every way. First there's that monolithic 17.3-inch display, ensuring every vista and digital realm gets its due, while the choice of either i7 or i9 core processors means there's few tasks this laptop can't perform. The Acer Predator Helios 300 is the best gaming laptop you can buy if you've got around a grand to spend. One of the benefits of gaming on the go in 2019 is the fact powerful components are now far more affordable, leading to new models with entry-level price tags that can run almost any game from your Steam library (and beyond). Here, with the Acer Predator Herlios 300, you're getting a beefy Nvidia GeForce GTX 1060 GPU and a lovely 15.6-inch FHD display to keep your PC gaming hunger sated, but you'll likely need to tinker with its settings in order to stop it from overclocking itself and burning a hole in your desk. The fact this is only a grand still blows our minds, and cements its position in our best gaming laptop 2019 guide. It's especially worth a look if you're hoping to get a lot of bang for your buck. The MSI GT75 Titan is one of the best gaming laptops money can buy in 2019. The MSI GT75 Titan certainly lives up to its name, delivering an incredibly fast and powerful system that clubs lesser gaming laptops into submission with a bombastic build and design, as well as a stacked suite of rapid internal components. Specs-wise, the combination of the Intel Core i7-8759H CPU, Nvidia GeForce GTX 1070 8GB GPU, and 16GB of DDR4 2,666MHz RAM make this a AAA-title crusher out of the box, and with 256GB of storage available in a 2x 128GB Super Raid setup there's plenty of room for games, too. A wide-array or ports and connections (including DisplayPort), a backlit mechanical keyboard, and a 2-year MSI warranty complete an excellent all-round gaming package. This isn't just a versatile 2-in-1 machine - it's also a gaming hub with serious clout. While the classic 2-in-1 design might not be the first thing you think of when imagining a portable gaming machine, Dell has proved it can be done – and done remarkably well – with the Dell XPS 15 2-in-1. The latest iteration boasts a Radeon RX Vega M GL GPU with 4GB HMB2 of memory and a reliable Intel Core i5-i7 processor. This being a 2-in-1, you're getting a lovely screen for your troubles in the form of a 15.6-inch, 4K Ultra HD InfinityEdge anti-reflective touch display so you watch and interact with your gaming machine without a hint of dullness. With that ultra-thin build, you really are getting an impressive entry to the gaming laptop market. The Gigabyte Aero 15X oozes style and features several nice touches on top of winning specs. Big, bold and beautiful, the Gigabyte Aero 15X crashes into our best gaming laptop list for 2019 with top-end specs and looks to drool over. This is going to cope with everything you can throw at it and then some, with an 8th-gen i7 processor, 16GB of RAM, and a GeForce GTX 1070 on board. Admittedly it's going to cost you a significant amount of cash, but if you're shopping up near the premium end of the market, then we'd say the outlay is worth it. There's no 4K screen either, but at this screen size it's not essential (and helps with the impressive eight hours of battery life).